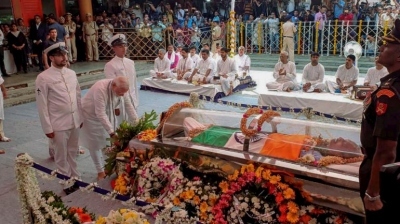 In a shocking incident, Goa Kala Academy, a government institution, performed a Hom (होम) today for Shanti (Peace) and Shuddhikaran (Purification), since former Chief Minister Manohar Parrikar’s mortal remains were kept there for the Darshan. Art and Culture Minister Govind Gaude, who is also the Chairman of Kala Academy, has ordered inquiry into this incident, stating that such unscientific activities cannot be promoted inside government buildings. Earlier, while talking to this journalist, Minister Gaude confirmed that he had permitted the staff to perform the religious ceremony. “They came to me asking for permission to perform Hom. I am not aware of any Shanti or Shuddhikaran”, he told this journalist in a telephonic conversation. Parrikar’s mortal remains were kept in the Kala Academy complex on Monday, 18 March, almost for a whole day before performing final rites at Miramar beach. Thousands of people had visited the place for Parrikar’s final Darshan, including Prime Minister Narendra Modi. The Shanti and Shuddhikaran ceremony was conducted for the whole complex with three Pujaris (priests). When a journalist enquired today morning what was happening, one of the staffers seen in the video told him that they are performing Shanti and Shudhikaran after Parrikar’s funeral. You may click here to watch the video, where three Pujaris and the staff of Kala Academy are seen even in the backyard of the complex, taking a round, while Parrikar’s mortal remains were kept for Darshan in the open square adjacent to the Dinanath Mangeshkar hall. 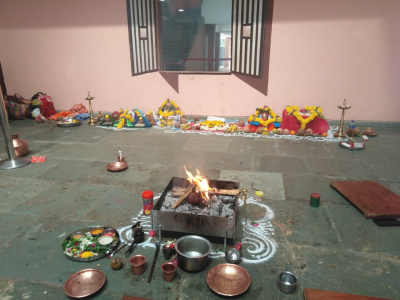 When enquired, the religious scholars told goanews.com that Hom is normally performed on three occasions: 1) If there is any impurity happened in the premises, 2) If you had assured (सांगणें) about such ceremony for any eventuality or 3) When any person dies. Sources in Kala Academy disclosed to goanews.com that the same staffers, who took initiative for this post-death ‘purification’ ceremony, had also objected to keep Parrikar’s mortal remains in the Kala Academy complex. I have taken a strong note of some activities carried out in Kala Academy premises as rituals today. I have ordered an inquiry into it. We cannot promote or patronise unscientific activities inside government buildings. The incident has also gone viral on Facebook, posted by journalist Manaswini Prabhune Nayak, narrating her own experience at Kala Academy today morning. If mortal remains should not be kept in government institutions, then will the Government also conduct such purification ritual of Miramar Beach? Did Kala Academy complex become impure because Parrikar’s mortal remains were kept in the complex? There is absolutely no harm in what has been done. We have to respects sentiments of Kala Academy staff. Atheists and anti Hindu people are making frivolous comments. Who is this manasi. What is her useless logic when she compares kala academy, a dwelling with Miramar beach which is an open space. It shows her knowledge of hindu rituals. Let matter rest as it is. It's hardly an issue.